Netvue can source all the products and installation materials needed for your IPTV or Digital Signage project. We carry out all the system installation work; from rooftop aerials and satellite dishes right through to Digital Signage software and display units. 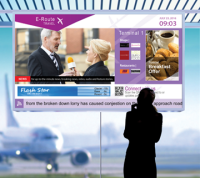 Create, manage and display eye-catching, dynamic HD digital signage with ArtioSign on Exterity's AvediaServer platform. Seamless integration with Exterity's IPTV solutions enables live TV and video to be quickly incorporated into impactful signage screens that inform, communicate and engage. With an intuitive drag-and-drop interface, ArtioSign combines powerful functionality with unparalleled ease of use for users of all abilities. Digital Signage display is available on any Exterity IPTV receivers connected to your network with full management and scheduling from the AvediaServer. Onelan have developed a range of advanced digital signage units that can deal with many forms of media, including IPTV video. The units can be operated standalone or as part of an IPTV system. Onelan digital signage is a highly scalable solution as multiple units can be networked together under the control of "publisher" units. The addition of digital signage players to an IPTV network provides branding, personalisation and customization opportunities, making digital signage a natural enhancement to an IPTV system. As an independent system integrator Netvue can also supply other manufacturers' products so feel free to Contact us for information on Digital Signage products by other manufacturers.